The most complicated piece of machinery in your garage (after your car) is your garage door opener. This unit is responsible for controlling the system every time you use it, and is connected to many different electrical and mechanical parts. As with any complex machine, there are a lot of things that can go wrong, and our technicians know how to diagnose and fix anything from a broken motor gear to a faulty circuit board. 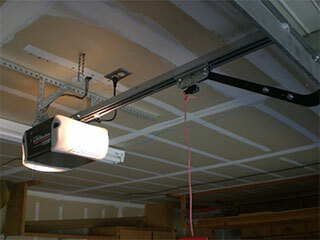 Garage door openers are built to last, but eventually even the toughest model will begin to develop some problems. When this happens, it can be very difficult to identify where the fault lies; there are so many interconnected parts that it takes an experienced eye to work out what’s gone wrong. Our technicians have years of experience with all the different makes and models, and we can quickly come up with a fix for every issue, from misaligned safety sensors to a worn out motor gear. We know that reliability only comes from quality, which is why we work with top brands like LiftMaster, Genie and Chamberlain. Whether you’re looking to upgrade your existing unit or replace broken opener, our experts will give you all the guidance you need to find the perfect new model for your door. Once you’ve made a decision, we will install the new unit for you, ensuring that it’s properly secured to the overhead blocking and able to work smoothly with your existing door. The best way to avoid accidents and breakdowns is to regularly maintain your garage door system. Our experienced technicians can inspect every part of your opener for signs of wear and check its various features to make sure they are fully functional. A key aspect of our opener maintenance service is testing the safety sensors. If they're alignment isn't correct or if there's some damage to their lenses, we'll realign them or replace them as necessary. No matter what type of problem your opener is experiencing, you can count on our team at Garage Door Repair Casselberry to help you with it. Give us a call today and let our technicians take care of everything.